2.Remove the florets of cauliflower and immerse in a bowl of hot water(add a pinch of salt & turmeric powder). 3.Drain the water from caulifower after 10 minutes and par boil them. 5.When the cauliflower is completely cooked,drain the water and cool them. 7.Make small balls and stuff the cheese inside. 8.Roll these balls and give a coating of bread crumbs. 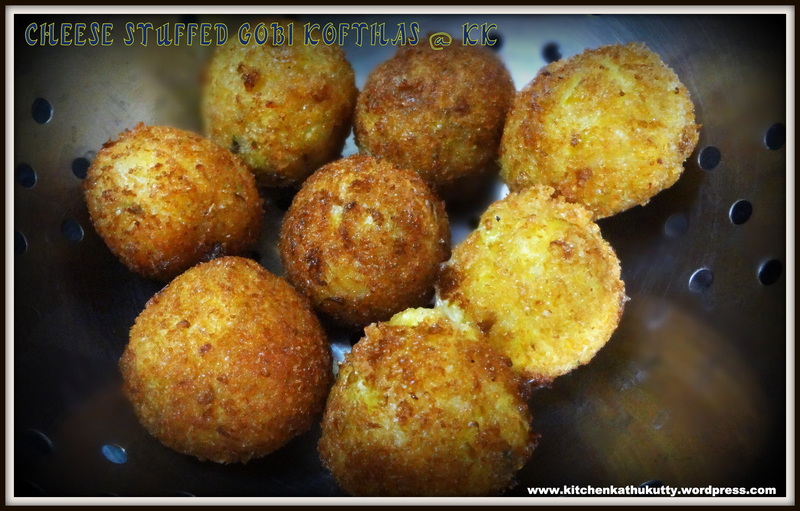 9.Deep fry these koftha balls and strain excess oil. 10. In a kadai heat ghee and add the chopped onion. 11.Saute them well.In the meantime make a fine paste of ginger,garlic,green chilly,mint leaves & coriander leaves. 12.When the onion turns golden brown add the paste and tomato puree. 13.Mix them well and saute till raw smell vanishes. 14.Add chilly powder and half cup of water and let it boil. 15.When it thickens well,add salt,kasturi methi. 16.Simmer and add milk and fresh cream. 17.Give a quick mix and switch off. This gravy will have a thick pouring consistency. 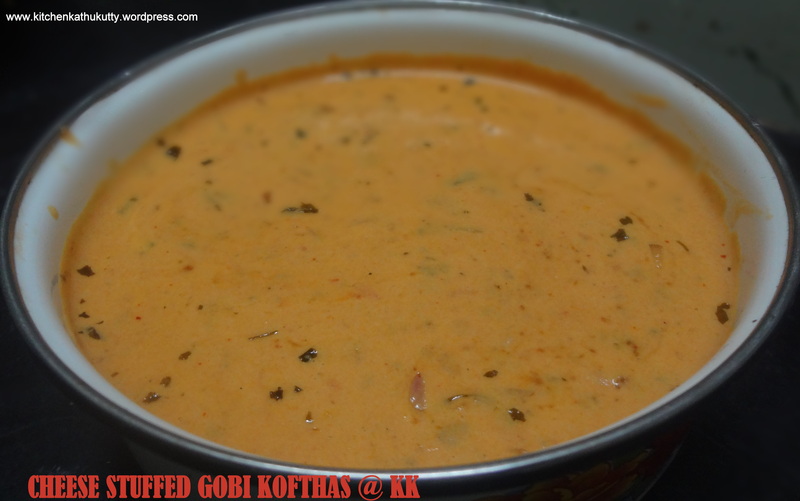 18.Add the balls/koftha to the gravy . Do not stir rigorously. 19.Garnish with coriander leaves and serve hot. This dish needs utmost care and patience. Cut the cheese into small cubes or else they might break and ooze out. Make balls big enough to hold the cheese cubes. Adjust the amount of salt used in gravy as we have already added salt in the koftha balls. There must be no water in the potatoes and cauliflower. Add corn flower according to the consistency of the mashed veggies. You can skip cauliflower too. You can also shred cheese and add to mashed veggies instead of stuffing. If you prefer this for your little ones,have a word with your pediatrician. You should have introduced all ingredients separately in prior. Please use home made cheese for babies and use whole wheat bread crumbs for rolling. 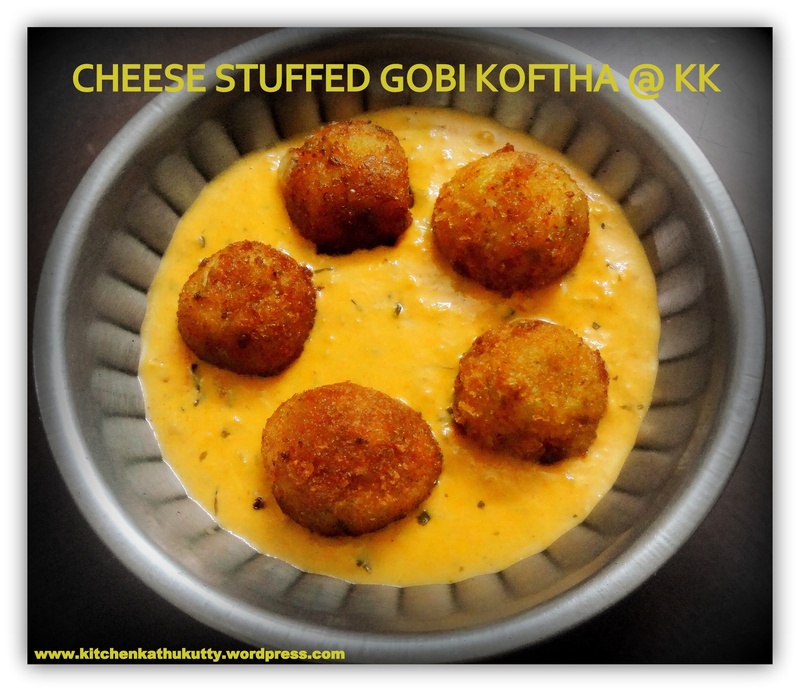 The kofthas as such will be enjoyed by little ones. Prefer home made cream. Do not mix the gravy after adding the koftha balls. It would break. Take care while frying the balls. Prefer medium flame. Ensure that they don’t break. The base veggies are of your choice. You can even add carrot,beans.